The production company that created "british cult tv"
As much as I can complain and pick apart this series, I am still inclined to be happy it exists. The Adventurer program came into the television world way late for the late 1960’s debonair bachelor secret agent character hype. This series would not be as entertaining without those clichés albeit in an older more mature form than its more glamorized predecessors. In particular the presumptuous star of the show, Gene Bradley played by the already self assured Gene Barry comes off as an aging privileged archetype character of what those slick agents would have become in the 10 years succeeding their career peaks. 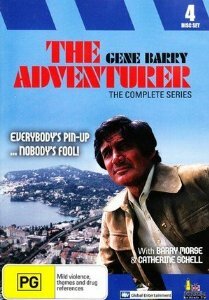 The Adventurer is a one season television series (1972-1973) that collected a cast from different walks of life. Gene Bradley is Gene Barry visa versa and so the character reflects the actor in a unique way. From interviews with fellow stars,Gene Barry was at the very least a difficult person to work with and especially to act with. One particular example is Gene’s relationship with Catherine Schell who played Diane Marsh, a useful yet rarely used agent, working with Mr Parminter. Gene Barry, recorded as being 6ft tall, took aim at Catherine, she was taller than him. Catherine was written out of scenes with Gene Barry and her role was greatly diminished for some time due to Gene’s anxiety with taller actors sharing scenes with him. Luckily, she came back to playing a bigger role as Gene slowly neglected the television series. Barry Morse was also in the crew, playing an über posh agent, Mr. Parminter, whose role morphed from the stereotypical “too right” Englishman to the somewhat inept bobbling sidekick to Gene Bradley. As the series went on, the storylines brought in the sidekick trio of Mr. Parminter, Diane Marsh and Gavin Jones to greater prominence in the show. In the beginning, when I started watching this series I was filled with anticipation for yet another agent tv series. The European locations, the recurring characters and familiar actors make such series rewarding for a fan. Gene Barry does the show a disservice coming off as an old wealthy lethargic creep. Either he was always a poor actor or simply he wrote off the series, squeaking just by the minimal in acting requirements. Barry Morse, a regular on ITC shows throughout its history, does an admirable job with the role he was give as Mr. Parminter. Catherine Schell and Garrick Hagon fill in the gaps, joining forces with Mr Parminter whilst on each investigation. It is rare when I mention negatives about a show made for entertainment sake so I will leave it to a minimum. The Adventurer is not a superb show and at times was laughable in it lack of authenticity. Its place in time and tv history is one valid reason for me to watch it, the scenes of 1972 Amsterdam and the 70’s attire of Gene Bradley still gives me some joy that this show was recorded. The code book is a fake? or not? Gene Bradley is sent off to convince Armand that the code book he has is the real one and to discredit Nita whom claims that it is the fake. Nita is being confused by Gene’s manipulation of her memory of their time together, ultimately showing her to be a forgetful lady and Armand is noticing. The safe which holds the “genuine” code book is broken into and a swap is made. Armand is certain that Nita has tried to fool him and she is promptly restrained. Gene Bradley will need to get Nita away from harm especially since he’s the one that put her in danger. The Good Book starts slow and choppy but the story begins to make sense as the true plan of Gene develops. Gene Barry plays the Adventurer who is sent to disrupt Nita’s intentions with Armand and to bring her back for Mr. Parminter. But this plan fails as Nita is able to get away from the spotlight and so she should. There is a humourous scene when Diane Marsh played by Catherine Schell flings herself into the safe room but the fill-in actor is an obviously buff male. LOL moment. Bradley finds out that there is a contract on his head. Not that this is unexpected however it is a serious warning. There is a big reward for The Adventurers head and plenty of suspects who do not like him very much. After narrowly escaping death, Gene is searching for answer to the people behind this attempt on his life. He’ll have to bait the assassins into a false sense of security in order for their real plans are to be exposed. Nice suit and tie. Gene Bradley is a marked man in this episode “Somebody Doesn’t Like Me”. A decent tale where Gene Bradley who also plays in the business market has built up the number of his enemies and the consequences marks him for death. Its easy to see why anyone would want to harm Bradley, a rich man, famous actor and government agent all in one. Peter Vaughn, who we see often in ITC shows, plays the antagonist role very well. A decent show, may watch it again. A friend of Bradley’s is buried to rest, after following a trail to an Italian castle in regards to a stolen antiquity. Gene is compelled to take up this case. The castle is harbouring a Russian icon and some other activity that peaks Bradley’s interest. The amount of security seems overblown for a castle just simply protecting the valuable Russian icon, there must be other reasons. Russian icons are indeed valuable and do have a history of thefts and forgery crimes associated with them. Icons have shown up often in ITC shows like The Baron and Department S likely because of its notoriety in society and come on, its Russian. Bradley is out trumped by some cool criminal characters in Icons are Forever, and I enjoyed watching it. Back home from another film set, Gene Bradley is made aware of an upcoming soiree at his new place. Unbeknownst to Bradley, someone has been masquerading as him and has set up a high profile meeting with some big money donors. For curiosity’s sake, Gene seeks out these tricksters and attempts get to the bottom of this charade and even become the charade. Bradley’s good reputation is at stake as he is being used as a mouthpiece for a confidence trick. Make it a million is a decent episode and ultimately still holds well against the earlier episodes. Barry Morse directs this story of confidence tricks, doubles and aircraft production. Gene is the likely victim in this case because of his enterprise skills and multiple successful business, his word can be trusted. I love the wonderfully dramatic scene, the reveal of the Bradley imposter was the funnest part of the whole episode. A story line of greed and investment advantage is a new plot for this series and a welcome change. Television has played its role on society and culture throughout the world. Since its conception, television has always been a new stage for creatives reaching far beyond the tradition physical audiences. Now this artform is often more compact than its sister media the “Movie” and as such the storytelling ability of those creatives determine the impact those TV shows have. ITC productions had that impact on me and here is why.